November 8th, Disability Action Alliance (DAA) members met the City of Chiba Mayoral Delegation at the Japan Local Government Centre, London. 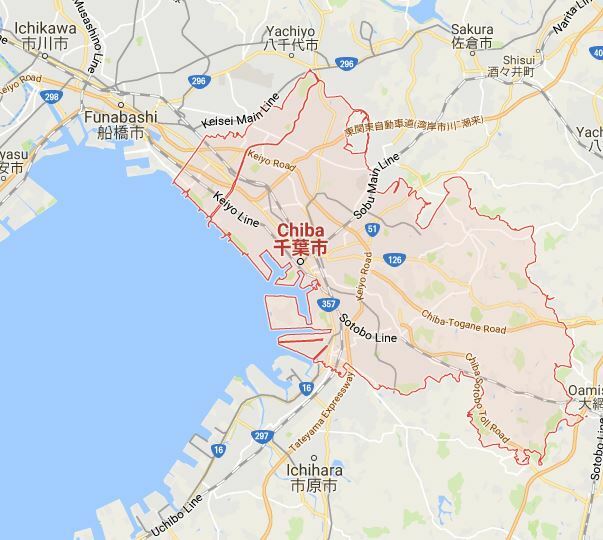 Chiba’s Mayor Yoshihito Kumagai is preparing to further the support for disabled people, at Chiba, host city local authority, in the Tokyo 2020 Olympic and Paralympic Games. Japan is under pressure to climb the disability medal table’ and not just in sport; – public attitude, media representation, access to the built environment, education, goods, facilities, services and employment all need a performance boost. Chiba agrees; in Japan, the Law on the Elimination of Discrimination Against Persons with Disabilities, came into effect April 1 (yes, I know!). It requires businesses to make a ‘reasonable accommodation’ of disabled people, but is vague about specifying limitations. That puts Japan roughly where the UK was back in 2004. Japanese media report ‘the law assumes good faith on the part of the public, including individuals, but it is up to Japanese local governments to spread the word’. Logical then, that Mayor Kumagai, an architect for change, should draw on the experience of the DAA members Martin Austin (Nimbus Disability), David Burdus (assist-Mi), Barbara Dewar (BlueAssist), Fiona Jarvis (Blue Badge Style), Dirk van der Merwe (Disability Karate Federation), Alison Lyons (Sesame Access Systems) and Noel Thatcher. Mayor Kumagai’s delegation comprised: Ryo Orihara, Secretarial Division; Ikuo Kashiwabara, Disability Self-Reliance Support Division; Fumitaka Ando, Sports Promotion Division and Tsuyoshi Tsukagoshi, Olympics and Paralympics Promotion Office Policy Coordination Division. 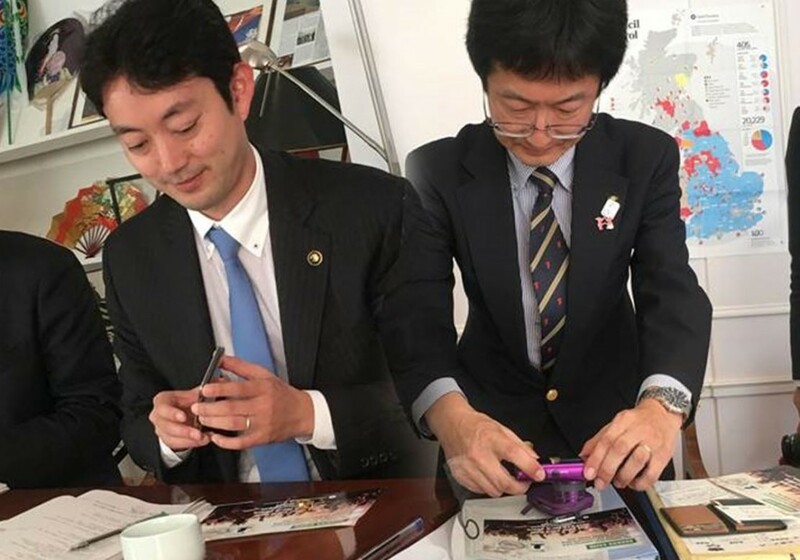 Picture: Mayor Yoshihito Kumagai (left) and Tsuyoshi Tsukagoshi, Policy Division (right) expressing interest in the assist-Mi app and the Nimbus Disability Access Card. In summary, the intense two hours meeting started with a polite ‘Konnichiwa’, and then went straight into business with Chiba City’s Schools ‘Disability Awareness Campaign – sending disabled people into Primary Schools to open up young minds. All present endorsed the awareness effort with the provisos that messaging should reinforce social modelling, disability equality form part of schools syllabus and CHIBA push access and inclusion for disabled children in mainstream schools as a matter of policy (in Japan, special schools are still the order of the day). Then, employment – Japan has a ‘supportive” system in which disabled people are helped to develop basic skills. We were shown a bracelet woven by a blind girl which was received ‘diplomatically’ – we recognised the value of rehabilitative activities but stressed this should not be confused with the right to access equal education and employment opportunities. Did the Chiba City Paralympic policy team employ disabled people? Fumitaka’s Sports Promotion Division employs a Rio 2016 wheelchair rugby bronze medalist. The delegation stated disabled people don’t customarily hold senior positions in Japan. DAA members stressed that moving forward needs a major mind-shift into valuing disabled people in the employment market at all levels. Dirk van der Merwe said he had visited Tokyo and advised there was a long way to go in terms of physical access especially in hotels and public buildings. Fiona Jarvis suggested the delegation look at the UK with regard to DDA ‘reasonable adjustments’ in 2004, Equality Act 2010 impact assessments and action plans and latterly the Equality Act ‘Public Sector Equality Duty’ which applies to local authorities. Had things changed for the better since London 2012? We explained that the Paralympic athlete experience was not typical of all disabled people and that outside Olympic stadia with their teams of volunteer supporters that access is still often poor, attitudes still exclude and disabled people still face major barriers to daily living, assistance, housing, health and employment; that in the UK, we still have a long way to go too. What positive legacy was left after the London Paralympic games? We felt that there was improved accessibility to some sporting venues and transport systems, a current increase in funding for grass roots disability and disability was higher on the agenda of corporations and government. Disability equality impact reviews across all policies, practices and procedures and across all local authority functions. Consultation programme with disabled people and staff. Continual dialogue with Government Departments and the Tokyo Olympic Development Agency. Key disability access planning matters. 5 year cyclical disability access plan (running beyond 2020) – include ‘critical’ access briefing. Employment of disabled people as part of delivery at all levels including high level. Include a Director of Disability Equality Post. Awareness programme of the Japanese public to new Law on the Elimination of Discrimination against Persons with Disabilities and the changes it mandates. Public relations campaign with positive image and concept around disability at local and national government level. An international local authority forum to share experiences. We ended the meeting in a DAA pincer movement. Martin Austin of Nimbus Disability asked “Will this represent an opportunity for DAA to work with local authorities in Japan with its early stage policy agenda around enhancing barrier-free places and opportunities for disabled people? I suggested the Mayor could bring DAA members to Japan to advise his team. I am not sure we got an official answer to either point but, in true Japanese style, there were a lot of business cards exchanged when the meeting was closed.